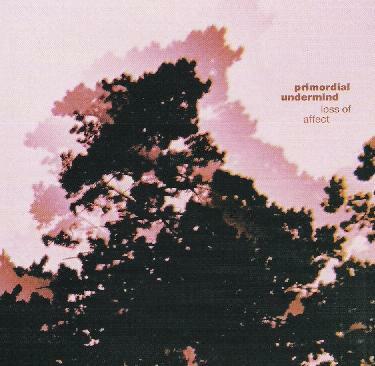 Primordial Undermind - "Loss of Affect"
The first time I saw Primordial Undermind was in Oakland in 1999 at a little Country and Western bar and I thought they were a good but very middle of the road psychedelic rock band. They soon moved to Austin Texas and quickly went from a psych space rock band to the best space rock improvisational band around. They kept taking the next artistic/music challenge (like all bands should do) and completely embraced the Church of the Friendly Ghost experimental/avant garde/improvisation scene. Eric and Vanessa Arn soon become the people that brought together all the various experimental and space rock bands into one "cohesive" Church of The Friendly Ghost sound/scene; the avant garde composers meet space rock acid psychedelia!!! So, the new Primordial Undermind album, Loss of Affect, is a documentation of the incredible artistic growth a psychedelic rock band can take in a very short time!!! This album was recorded at The Still (www.stillrecording.com) by Douglas Ferguson who also plays on these recordings. It ws recorded in September 2004, all live no overdubs. The lineup is Eric Arn - guitar, Vanessa Arn - electronics and percussion, Otis Cleveland - alto sax, bass clarinet, flute, hammer dulcimer, electric kalimba, percussion, alternating interference, Johnny Mac - drums, percussion, Joe Volpe - bass, with special appearances by Douglas Ferguson - electronics, and John Wilkins - drums. INTERCESSOR: artin' hard, Primordial runs head on into the Church of Friendly Ghost experimental/improv scene!! Sounds great, totally captures the still Friendly Ghost sound that was unique to that building!! A total departure from previous Primordial Undermind albums. BREATHE DEEP: Very German psych, a nice Eric Arn guitar work out. I wonder if this was all improvised? Yes it must be, I can hear people breathing and moving around. Some "John Fahey" moments!!! Very Ptolemaic Terrascopey, the old world Spanish acoustic guitar style!!!?! 3RD CLASS SISSY: Improv workout of guitar, bass, Johnny Mac percussion, then full on Rawk drums. Now there's some Otis Cleveland alto sax. Now at 3:30 we're getting into deep space. COLOR OF NOTHING: Some sax, some droning, some other sounds? Nice, intense, messed up, experimental improv with cool pulsation either by Vanessa Arn or Douglas Ferguson? Very nice swelling effects! Is that you Doug?. DRIFTGLASS: Atmospherics, nice guitar, now full on Rock Band Rawk! Pretty dramatic space rock. Very nice. My brother Joel, who plays guitar in ST 37, said that when they went on tour with Primordial Undermind in 2003 that on the first part of tour ST 37 was getting most of the after show praise, but as the tour went on the Primodial Undermind folks underwent some kind of psychic Space Rock God transformation and apparently never looked back!!! IN VIOLATION: Very Dr. Who'ish, science fictioney, are those real words? TREMENS: Guitar bass drums noise grind. Get's more Spiffy Spy soundtracky, now some flute? Now it's slow and introspective with more flute. PERTUSSIS: Drums, electronics and guitar, the successful transition from space rock to experimental! Some warblin' moanin' improv non-rock vocals, some flute again, maracas, shakey things. BLINDING STARS: Some Eric Arn guitar, drum rumbles, cool riff, very Country Joe and the Fish circa 1967 meets Bloodrock. Some Otis Cleveland sax "gettin' it". When this CD ends you want it to keep going!!! Music is art and Primordial Undermind do what all great artists do! Create Art!!! Sounds simple, but it's not!!! For more information you can visit the Primordial Undermind web site at: http://www.myspace.com/primordialundermind.